On this date in our family history . . . the 16th day of October . . . in the year 1999 . . . descendants of the children of William Paschal Henry and his wife, Josephine Wingfield Henry nee Davis, gathered in Milam County, Texas for a family reunion . . . The Rockdale Reporter. Rockdale, Texas. October 21, 1999. In these pre-dawn hours of "the new millennium," approximately seventy descendants of William Paschal and Josephine Wingfield (Davis) Henry gathered in the Minerva Community Center in Milam County, Texas for a family reunion. This event, held 16 October 1999, was coordinated by granddaughters of Milford and Dorris Henry — Monica (Sheppard) Landi, Carla (Henry) Schomburg and Heather (Henry) Williams. The family gathering took place a short distance north of the site of a parcel of land where Wm. P. and Josephine had set up housekeeping c. 1878. SHE CAME FROM GEORGIA, HE FROM KENTUCKY — It was a winter's Tuesday in Civil War Texas when Josephine became the bride of Wm. P., then a young Confederate soldier. The date of the ceremony was 1st March 1864, and the location was Brazoria County on the Texas Gulf Coast. At that time, the counties of Brazoria and Matagorda were threatened with the possibility of invasion by Federal blockading forces intent on stopping the delivery of any supplies into Confederate ports. 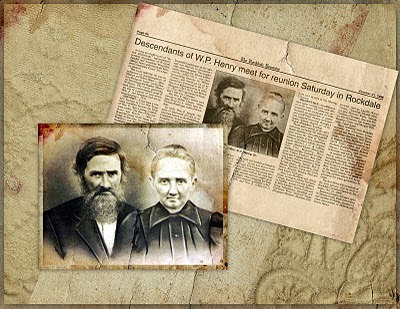 A little over a decade later, in October of 1876, this couple and their five surviving children arrived in Milam County for a visit with Dr. Milton G. Antony, and his family. Dr. Antony, a practicing physician in Rockdale and Cameron, was Rockdale's postmaster at the time, and was married to Josephine's older sister, Margaret. The Antony's newly-married son, Edwin LeRoy Antony (1852-1913), was then prosecuting attorney for Milam County, and would go on to be elected as a Democrat to the U. S. House of Representatives in 1892. Margaret (1833-1912) and Milton (c. 1824-1885) are buried in Rockdale's Old City Cemetery. Wm. P. was said to be "...one of our most substantial and upright farmers," and he would live out the remainder of his days in this rural community. The circumstances surrounding Josephine's death were reported in detail in a November 1899 issue of The Rockdale Reporter. When (the body of Josephine) was found between her home and that of George Banzhaf, near the gate that leads to Dr. Isaac's home, she was lying across the axle dead, with her hair and clothing wound around the spindle of the buggy. The story went on to say that "Her neck was doubtless broken by the fall..." as she was thrown from the buggy following a collision with a wagon driven by two young men. As her horse bolted, her long hair came undone and was caught up in the buggy wheel, dragging her body for some distance. Josephine (1842-1899) and Wm. P. (1836-1912) were laid to rest in the Murray Cemetery. Heather, Glenn & Morgan Williams, Sugar Land. Donna (Christian) & Joe B. Rogers. A number of family members found it necessary to cancel at the last minute, including Georgia (Henry) Kaseberg, formerly of Rockdale, who is now living in Leander with her son, Bert. Georgia has been a Keeper of the family history for much of her life, and her efforts will be appreciated for many generations to come. The first Henry-Davis reunion of the next century will be held at Rockdale Christian Church on Saturday 21 October 2000. Reunion planners will once again be Monica Landi, Carla Schomburg and Heather Williams, assisted by other descendants of Milford and Dorris Henry. i do love your family history -- it's interesting, you frame it wonderfully well, and it's just a treat.